The weather this weekend could not have been better. Highs in the 70s and a little breeze. Perfect in my book. It definitely made me want to make a days until summer vacation count down. We kicked Friday night off with some time in the park. Last summer, Wesley was really too small for swings, but he seemed to love his first experience this spring. Much more of that to come. Then over to our usual Friday night dinner with friends. We have a couple that we get together with most Fridays. The kids play. We eat, drink, and enjoy. 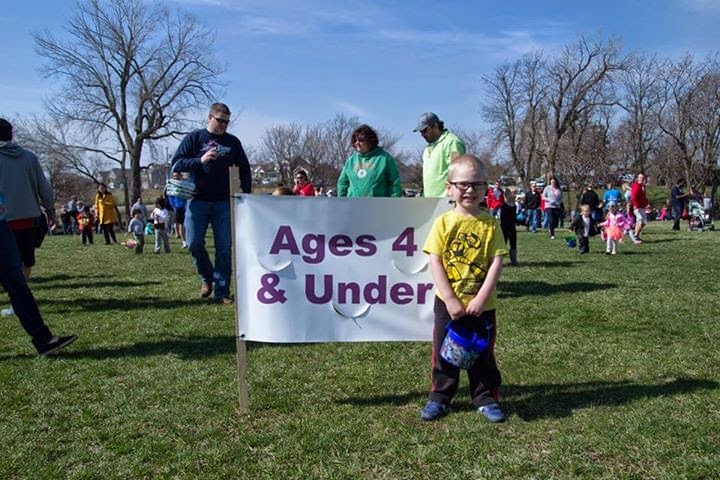 Saturday morning, our town had their Easter egg hunt. I stayed home because it was during Wesley's morning nap, but Henry got enough Tootsie Rolls to last for a while. Crazy enough, it's taken 4 years for me to dye eggs with Henry. I have had this same kit in the cupboard for two years. I got it on after Easter clearance for next to nothing, and there's still dye left for next year. We had so much fun trying out color combos. I also forget how easy and tasty hard boiled eggs are. This is my Easter outfit. I realize every year I hope it's warm, and I end up freezing my tail off, so this year I went with some sleeves. I was very happy I did, though by the time we got home from brunch, I was ready for shorts. And here's our little family. We didn't choose the best backdrop, but our neighbor was kind enough to come across the street and take a picture. She got Henry to smile when he was in a foul mood, so I'll take it! Love my boys!